Thread: Beginning hand piecing project? I have never hand pieced a quilt of any size. I will be travelling in May (2 9 hour flights and many train rides) and thought a small hand piecing project could keep me occupied. Please pass along a good beginner project idea. It will have to fit in a gallon ziplock bag. I cannot use scissors on the plane trips, but I can check a pair in my suitcase. I can use nail clippers to clip threads. I am not looking to piece a large quilt, a cushion cover, wall hanging etc would be plenty bit and fit into my bag. In the past I have taken counted cross stitch, but I find the lighting on planes is not adequate for that any more, or perhaps it is my aging eyes. Perhaps I could bring a book light. I will be taking a rotary cutter or mat along. I will have to do all my cutting prior to leaving. I have looked at hexies, not discounted them yet, but it appears there is lots of prep for them. I have one day to get this organized, between my last day of exams, packing and leaving. I leave in 2 weeks. I believe you can bring along scissors with blunt points. If I were looking for hand work, I think I would prefer to do hand applique, embroidery, or English Paper Piecing over regular piecing. However I usually read and people-watch when traveling. Embroidery would be my choice. Though probably a lighting challenge, like you have found with counted cross-stitch. EPP is great for portability. I take it along for hotel boredom or when my car is in for servicing. Though to me there are too many pieces to have and still be considerate of your seatmates (unless they are travelling with you!). To say the least, I would probably have the EPP papers flying all over the place! For scissors you might want to get a set of these ... I am sure they meet the plane requirements. I have mine on a lanyard along with a mini pin cushion. Works great when I am handsewing in my favourite chair in the family room. Keeps track of all that I need right at hand! Knitting? Crocheting? ... though not sure about the travel restrictions for the needles and hooks. Two weeks to prepare, but only one day allotted for prep for traveling hand-work? That definitely limits your choices.....EPP is my choice, but I really don't think one can get a "kit" together in one day, if not having done before. That is, getting papers either purchased or compiuter generated & cut, fabric decided upon and cut to size, glue stick for batting, if using that method.....and of course, a pattern to follow.........so many available. Whatever you decide to do, have a wonderful trip! I know I have not given myself enough time. I did a similar trip last year and wished I had some hand work along with me. I did people watch, Sudoku, read, watched videos on the flight, chatted with seat mates etc. Unfortunately I do not sleep on planes trains etc. I do not think knitting needles are allowed on flights. They were banned after 9/11 for many flights, but it was not across the board. My step-mum boarded one flight no problem with knitting needles, but when she transferred at LAX, they were confiscated. I could check into a crochet hook. Look into inklingo. You print the pieces and seam lines on the fabric with your inkjet printer. Cut them out and sew together. She has a number a different patterns you can choose from. You could print a few pages out in an evening, then cut them out another evening. Just a few minutes per evening, maybe 30 at most, for a couple evenings and you will have your pieces ready to go. As far as scissors for thread, some needle threaders have a thread cutter built in. You can use a dental floss container cutter for cutting threads. Not sure what project would be best. Hand piecing does not have to require a lot of prep. I learned by watching a Jinny Beyer video years ago. All she does is cut out the pieces and sew (using a single strand of thread). She "eyeballs" the seam allowance. If you are uncertain about doing that, you can pencil in the seam allowances or -- even less work -- just place a piece of blue painter's tape on a fingernail and mark 1/4" with a permanent sharpie on it. Use that to check your seam allowance periodically. It is a very forgiving process. If you find something "off" later on, you just snip a thread and re-sew. You do need to secure the thread at the beginning and end of each piece. It's also a good idea to take a small back stitch every inch or two. Inkligo would be another easy way to mark sewing lines. I would urge you to watch some hand piecing videos and practice on a few pieces before embarking. I have never seen a hand piecing video as good as Jinny Beyer's, but if I find one I will post it. Last edited by Prism99; 04-14-2018 at 03:18 PM. - thread and needles (I usually only carry one spool of a mid-tone neutral; either grey or brown. You can bring more if you want). - a couple Wonder clips, and/or a roll of scotch tape for holding pieces together as you stitch them. - fabric - mini charm packs (2.5" squares) work nicely with 1" hexagon papers. I've also taken 2.5" strips, and just cut them off as I go. The whole thing will fit nicely into a smallish container - I use a 7x7x2.5" photo box I got from Michaels, but a big ziplock bag would work great as well. I don't cut the squares of fabric into hexagon shapes. I glue baste, and just have the bit of extra seam allowance. PS: Whatever you take, good luck on your exams, and have a great trip! Last edited by Jennifer23; 04-14-2018 at 06:00 PM. I agree with Barb. Grab a bag full of 2 1/2" squares and hand piece 4 patches every chance you get. You can press and assemble when you get home. You can never have enough 4 patches as an addition to any quilt or to use in a stand alone quilt by itself. Have a great trip! When I travel, I usually pick out a pattern with squares that I want to do embroidery designs on. Then I can just bag up the squares and the threads intended. I usually use a pair of nail clippers for cutting threads. Just something simple. Right now I am working on a Sudoku quilt, with items representing the numbers; say one apple, two hears, three stars, etc. These are cut out of different fabrics and bonded to the squares. I then embroider them along the outer edges. It's a good project that I can carry when I go somewhere and work on when I have the time. Once they are all done, I will sit at the machine and sew them all together into a lap quilt. Quilting is either a passion or an addiction; I have yet to decide!! On a long trip to Israel I took a 24" background piece and some previously cut out pieces to applique. I hand appliqued them a little at a time as I felt like it and when I returned from the trip I made a pillow out of it. Now I have a remembrance of my trip each time I look at it. It gave me something to do besides just watching movies or reading, and I learned more about applique as well. I used a little round disc to cut thread. I do like the idea of the dental floss though. Never thought about using that. My DH and did a one month (5500 mile) road trip Feb-March and I took a couple of hand projects for the car. Besides a crochet baby blanket, I did this appliqué project for a wall hanging. It is Anna Marie Horner’s Spring Bloom. It is free on her website. I prepared all the pieces before we hit the road. You can take Bamboo knitting needles. I flew to South Africa and back and knitted away. I watched a video where she didn't cut the fabric into hexagons, just used squares. I've decided to start an EPP project. I think I'm going to try doing it that way. Yoyos are very portable, even if you use the Clover circle that makes it easier (it works well with charm packs, though you do need to trim the extra fabric.) So are Grandmother Flower Garden blocks if the pieces are precut. I don't use paper - just sew the hexagons together. Considering the amount of time you have, you probably want something easy. No one here has mentioned it yet, but there are Cathedral Windows. Here is a pretty good video on doing all the prep by machine. Because of your trip, you can machine sew a bunch of the background squares and only pre-sew by machine 2-4 blocks together ahead of time, or just do it by hand on the trip. She makes hers 8", but I do 9" muslin to start. And if you have a charm pack, just cut the 5" squares into (4) 2.5" squares. However, even my mom does the squares by machine. She connects them by hand, but only bc she wants to and that can be done on the go. *I also have a hand piece project that I am sporadically working on. But if you've never done it, I'm not sure a trip is the time to do it. I flew from the US to Cozumel in 2016 with knitting needles. When I went to fly home a week later, they actually had a list of things not allowed as carry-on. ALL needles (knitting & sewing) and hooks were not permitted.... Thankfully there was a movie, but I was disappointed in my boredom...lol So, check with the TSA, but know that things might change. Just be sure to find out before you check any luggage. I was able to stash my items before we got to the counter so nothing was taken. I believe you can bring along scissors with blunt points. That depends on the country and/or the airport. Multiple US airports passed my kindergarten scissors, but the airport in Dublin confiscated them. Because, you know, gimpy old ladies hijack planes all the time with their kindergarten scissors. I stopped by one of my local fabric shops and purchased 100 2 inch hexie papers. It was all they had in stock. I had a couple hours on Tuesday and was able to attach the paper to 36 of them. I found a F8 bundle of 9 different fabrics that I will use. I must have won the F8 as a guild door prize, as I do not remember buying them. I was able to get 6 Hexies out of each one. I still have 3 to cut up. 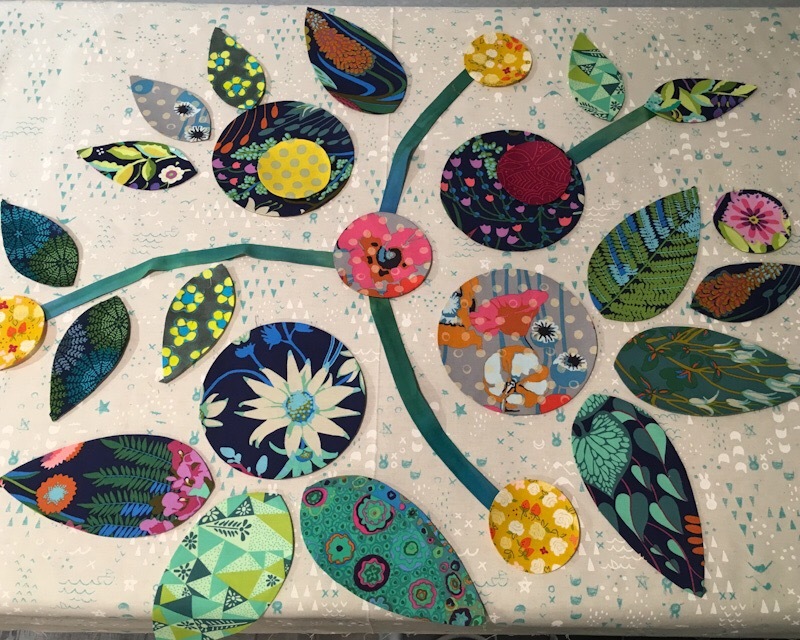 I think I have decided to make flowers out of them as I am getting 6 from each cut of fabric. I just need to decide on the centre piece. When I come home I will put them together into a larger project. I will try to find more 2 inch hexies locally. I know the 2 inch size is quite large, but as a beginner project they will give me faster gratification. I am not flying through any US airports this trip. It will be flights in Canada, France and perhaps the UK. If my sewing needles are apprehended, I will not sew on the flight, but can still sew on the trains. I once saw a woman knitting with two pencils with rubber bands wrapped around the eraser ends to create a 'stop'. I can crochet close to my body, but when I knit, I am all elbows out to the side. I understand the 'rules', it is not that the person carrying the scissors or needles will hurt someone, it is that they could be taken from you by a bad person. The 9/11 attacks they believed the box knives were not carried onto the flights by the bad people. It is important for air travel be safe for those on the planes, and those on the ground. It is frustrating when the 'rules' do not appear to be consistently applied.